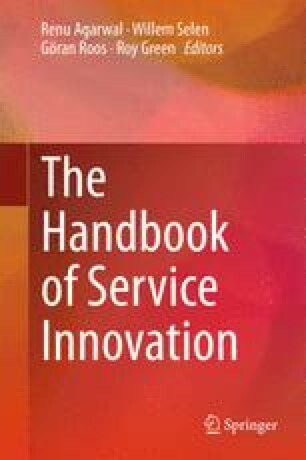 This chapter explores the intrinsic characteristics of services and service systems and presents systemic approach to produce service innovations. The chapter consists of elaborating the characteristics of services and the principles of systemic development, discussing service matrixes, service systems, service strategies and business models, and special challenges related to the development of services and service innovations. Services are always produced in service systems consisting of combination of service personnel and information systems. Customers are involved in these systems by interacting with the front end of service organization. The key issue in service development and innovation is to build the right architecture to capture all aspects of service systems from customer relations to back office information systems. The desired user experience is created by all aspects of service systems including the contact with personnel, the user interface, and the trustful and efficient information system. In the chapter, we present an approach that starts from the needs of people and through categorization of service types and service strategy types develops understanding about service systems and their dynamics. The proposed approach also provides insights into design thinking and its implications to service development and radical service innovation.